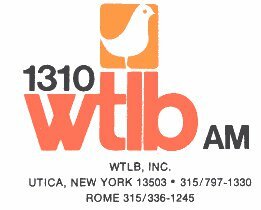 Up now is a wonderfully restored 9 minutes of little 1310 WLTB. Upstate New York, it seems, was a hotbed of radio activity. Good sounding stations, too, as you’ll hear in this recording of what might sound, to one’s untrained ears, a little bit like the George Michael show on WABC. Fooled ya! We don’t know Mr. Reed’s real name but we sure like “The Reed Thing”! Includes an (almost) complete newscast. 1974 is when WRUN went top 40, before that WTLB was the only game in town. WNDR in syracuse day pattern hit Utica at 1260 they were right next to WTLB at 1310. WNDR was top 40 as well. Uticans would surf back and forth between the two stations day time. At night WNDR changed pattern and (the signal) missed Utica. WTLB went 500 watts directional at night awful pattern that covered just the city and not much else… when WRUN crushed WTLB at night is when they started simulcasting on 107.3 FM. the FM signal would eventually become WRCK (rock 107) the station I was on for most of the 80s. I was also told that in the 60s and early 70s because of WTLBs night pattern WKBW and WABC had a following in the area. Thanks! Written better than we could here at Airchexx Studios! This guy is good.Hudson & Landry on the Yamaha spot. oops “space man” cary paul of 99x fame used the name “rock marshall” on WTLB… he was on one of these breaks doing a tag on a spot… great voice… and he was the overnight guy… that had a production shift at 5:30 am when his voice was burned out. Fred Reed’s real name is Quincy McCoy, author of “No-Static: A Guide to Creative Radio Programming.” I listened to WTLB while growing up in Utica back in the 70’s. It was the station to listen to. Thanks for posting this clip to the web! Quincy McCoy went on to WNEW. Actually, Quincy McCoy’s real name is Fred Reed. As Dave Arnold mentioned, he was program director of WNEW-AM in New York, music director (briefly) at WASH-FM in Washington under Bill Tanner in 1984, and director of national promotion for Fantasy Records. Quite an interesting career track, and a true gentleman. Loved hearing “The Reed Thing” once again on WTLB! I was Program Director there at that time. Fred got his air name Quincy from legendary producer Quincy Jones, and McCoy from Sid McCoy who spun Jazz at night in Chicago. I think it mighta been WCFL. He was a local boy from Utica, so back then used his real name. As Quincy he had a very successful career as reported above.